How does Bulk SMS Work.? Short Message Service (SMS) is a mechanism of delivery of short messages over the mobile networks. It is a store and forward way of transmitting messages to and from mobiles. 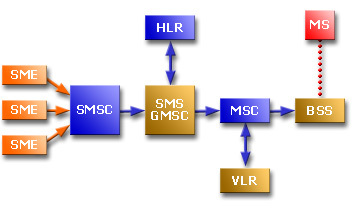 The message (text only) from the sending mobile is stored in a central short message center (SMSC) which then forwards it to the destination mobile. The figure below shows a typical organization of network elements in a GSM network supporting SMS. The SMSC (Short Message Service Center) is the entity which does the job of store and forward of messages to and from the mobile station. The SME (Short Message Entity), which is typically a mobile phone or a GSM modem, can be located in the fixed network or a mobile station, receives and sends short messages. The SMS GMSC (SMS gateway MSC) is a gateway MSC that can also receive short messages. The gateway MSC is a mobile network’s point of contact with other networks. On receiving the short message from the short message center, GMSC uses the SS7 network to interrogate the current position of the mobile station form the HLR, the home location register. HLR is the main database in a mobile network. It holds information of the subscription profile of the mobile and also about the routing information for the subscriber, i.e. the area (covered by a MSC) where the mobile is currently situated. The GMSC is thus able to pass on the message to the correct MSC. MSC (Mobile Switching Center) is the entity in a GSM network which does the job of switching connections between mobile stations or between mobile stations and the fixed network. A VLR (Visitor Location Register) corresponds to each MSC and contains temporary information about the mobile, information like mobile identification and the cell (or a group of cells) where the mobile is currently situated. Using information form the VLR the MSC is able to switch the information (short message) to the corresponding BSS (Base Station System, BSC + BTSs), which transmits the short message to the mobile. The BSS consists of transceivers, which send and receive information over the air interface, to and from the mobile station. This information is passed over the signaling channels so the mobile can receive messages even if a voice or data call is going on. Website thru Bulk SMS Service, No any Desktop Software required. Getting a Live Report of all Sending SMS. Send SMS via Schedule/Future SMS.